Remember how Robert Downey Jr. and Jude Law took a classic like Sherlock Holmes and completely wrecked it? 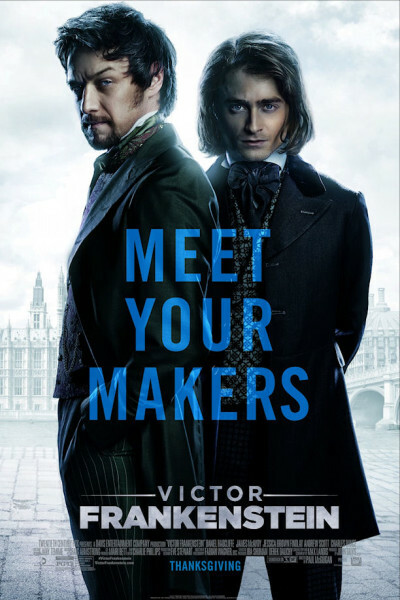 It's as if someone like Guy Ritchie took Mary Shelley's classic and decided to remake it using the producers of CSI or the anatomical works of Drs. Henry Gray and Henry Vandyke Carter. Lots of weird, animated, digital overlays throughout make the entire film 100% Velveeta. p.s. Daniel Radcliffe: Fire your agent posthaste. Woman in Black, Horns, Now You See Me 2? Beware the Ides of March, dude. Any more cheese and Harry Potter's gonna be your Home Alone. p.p.s. James McAvoy: Take it easy on spitting while enunciating, would ya? This ain't Peeta meets Shakespeare.